As a veteran writer, photographer and page layout artist (now called graphic designer), I have just about seen it all in the 35 years since I first laid eyes on an offset printing press back in 1974. I had stumbled into a "Reprographics" class after washing out of electronics on the very first day when it was discovered there was actual math involved in the study of electrons. Since Av8rdan doesn't care for adding and subtracting letters like they wanted me to do in pre-algebra, I decide that it made far better sense to use those letters in words to create sentences and write stuff that other people liked to read. I have had numerous assignments in the magazine, newspaper, commercial printing and ad agency trades, and have had a fair amount of success generating a little revenue with my cameras. But the one thing that has always been a constant in this career of mine is writing...lots of it. I want to invite all my readers to go here and take a quick survey to try and see just what you think of this work. I have crafted 10 quick questions that will only take you a few seconds to answer, and there is purposely not ANY contact info for you to fill out, so there is no chance of me sending your name and number to Nigeria. 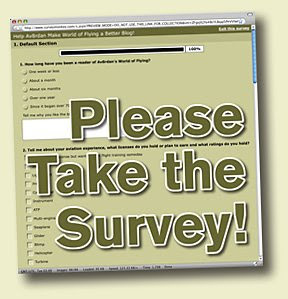 If you have a moment, please follow this link and take the survey. This is your golden opportunity to become part of my process. None of the questions in my survey are hard, and all give you the chance to add way more then .02 cents. If you've ever tired of my bashing of that guy who used to live where Barack and his family now live, taking my survey will provide a soapbox to let me have it. Or, if you can't wait for another story about flying around in the Katyliner, let me know that by taking the survey. I know that like myself, you'll be glued to the DTV tomorrow watching the non-violent revolution come down in WDC as we take the country back from the hands of those who have tried without success to break our spirit for the last eight years. 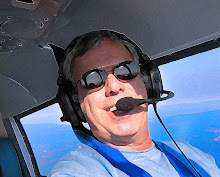 So I will keep this survey up for a while, and conveniently remind you, my readers, to go here and contribute to making Av8rdan's World of Flying an even better blog. When I have enough readers' input, I will post the results so you can see just who is joining you here. And if you are kind enough to go here and take this little survey, I am thanking you big time.